ISLAMABAD: As part of the U.S. Government’s efforts to strengthen Pakistan’s agricultural sector, the United States Agency for International Development (USAID) has been working with the Pakistani government and private sector since 2009 to expand the market of Pakistani mangoes globally. Stakeholders organized the Mango Gala in order to celebrate this long-term partnership and its many achievements. 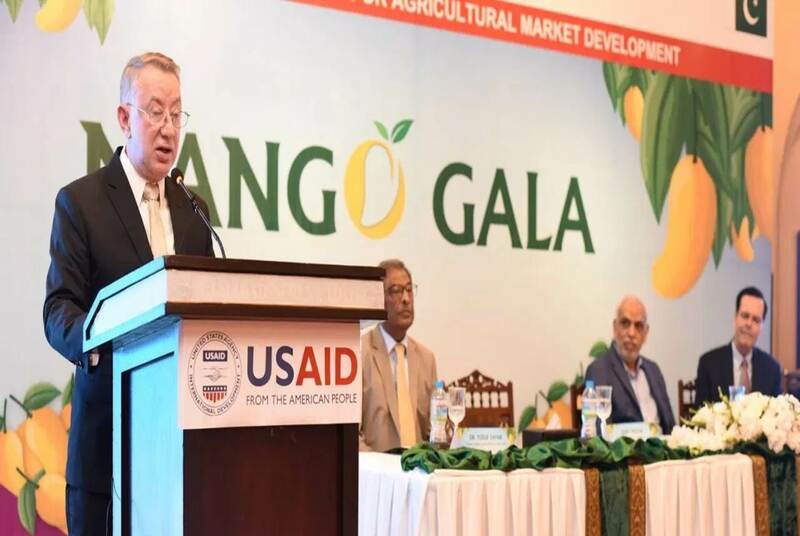 USAID/Pakistan Mission Director Jerry Bisson, Chairman of the Pakistan Agricultural Research Council (PARC) Dr. Yusuf Zafar, Federation of Pakistan Chambers of Commerce and Industry (FPCCI) President Ghazanfar Bilour, and Mango growers from all over the country attended the Gala. Addressing the mango sector stakeholders, Mission Director Jerry Bisson said, “The U.S. Government, through USAID, is proud to partner with the Pakistan mango sector in developing new markets, while ensuring compliance with international grading standards and export protocols,” Stating that, “We want to ensure that Pakistani mangoes are competitive on the international market. “We are confident that by facilitating infrastructure upgrades, introducing new technologies and promoting market opportunities we will increase exports to high-end markets, improving revenues for Pakistani mango farmers and exporters,” Jerry Bisson added. The event brought together stakeholders from the public and private sectors to investigate trends and opportunities, recognize local farmers’ innovations in, and reaffirm USAID’s commitment towards uplifting Pakistan’s mango sector. USAID launched the U.S.-Pakistan Partnership for Agricultural Market Development in February 2015 to improve the marketing capacity of four Pakistani value chains; meat, high value and off-season vegetables, mangoes, and citrus. Since 2009, USAID has supported mango farmers in upgrading fruit processing technologies and addressing export protocols more efficiently. Under the project’s grant program, USAID has provided 13 state-of-the-art mango graders. These graders became operational in 2017 and will be utilized during the 2018 production season to grade export quality mangoes. This partnership has served as a catalyst to improve the quality, increase the quantity of agricultural produce, and promote cooperation among farmers, processors, exporters, and buyers of Pakistani agricultural products, resulting in both increased incomes and employment opportunities.